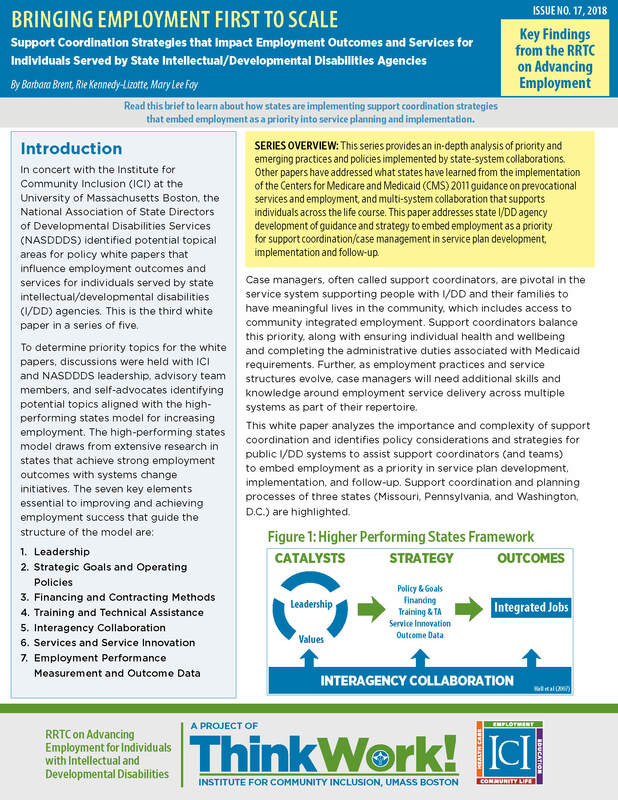 To determine priority topics for the white papers, discussions were held with ICI and NASDDDS leadership, advisory team members, and self-advocates identifying potential topics aligned with the highperforming states model for increasing employment. The high-performing states model draws from extensive research in states that achieve strong employment outcomes with systems change initiatives. The seven key elements essential to improving and achieving employment success that guide the structure of the model are: 1. Leadership 2. Strategic Goals and Operating Policies 3. Financing and Contracting Methods 4. Training and Technical Assistance 5. Interagency Collaboration 6. Services and Service Innovation 7. Employment Performance Measurement and Outcome Data.